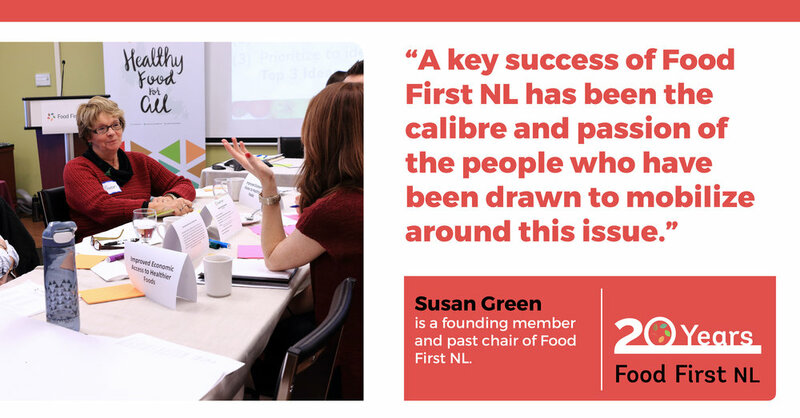 As a founding member and past chair, Susan Green knows a lot about what has made Food First NL a success in its first 20 years. For her, it was always about the organization’s ability to bring like-minded individuals together and create a passionate, capable network of people to advance awareness and action around food security. As a founding member and past chair, Susan Green knows a lot about what has made Food First NL a success in its first 20 years. For her, it was always about its ability to bring like-minded individuals together to create a network of people to advocate and create awareness about the importance of food security. “A key success has been the caliber and passion of the people who have been drawn to mobilize around this issue,” says Susan. “Whether it be volunteers or paid employees, Food First has always managed to find the people with the necessary skills and talents to take the organization to the next stage of development,” says Susan. “The success is also due to the many who have volunteered on the board of Directors over the years and to the current Executive Director, Kristie Jameson, who has worked so hard and so capably to implement the vision of Food First,” says Susan. 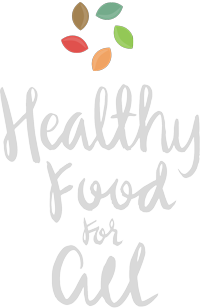 In addition to helping establish Food First NL twenty years ago, Susan played an integral role in the early days of both the School Lunch Foundation and Kids Eat Smart Foundation of NL. So she’s particularly happy to see new Food First NL projects related to school food, like the Farm to School program, which aims to get local veggies and fruits in school cafeteria salad bars. For Susan, there are many reasons to engage youth, and she sees them as a key demographic for Food First to continue focusing on. “Young people are committed to a more sustainable way of life, and therefore are actively involved in knowing where their food is grown, and much more committed to establishing farmers markets, protecting agricultural land, and cultivating personal and community gardens,” says Susan. With Food First NL’s AGM coming up this month, Susan has faith in its network, partners, and the general public to continue helping to shape the organization’s future. Register here to attend our AGM and 20th birthday celebrations on November 28th.